Which mean that I had a bit of investigating work to do. I had Paella before, the good kind, actually the excellent-authentic kind, right in Spain, overlooking boats and water and… mmm’ok, let’s just say that it was so good, my taste buds still have a pretty good memory of it. Trying to beat my taste buds memory is a tough act to follow. They are very judgmental and picky about food. Especially when it comes to authentic food dishes. There are differing opinions on the web as to whether paella started out as a seafood-based dish or a chicken and rabbit dish. Who knows, but today, you can choose from a wide variety of paella recipes. We were both craving seafood, and we knew it would be faster to cook than if we used any type of meat, we decided to go the mixed seafood paella. Since I set the bar high with finding the right recipe and the most accurate method. I called a friend that is originally from Spain and got a couple of “rules” or “traditions” in order for our first paella to be as genuine it can be outside of the “mother country”. Authentic paella should be made with short or medium grain rice that will absorb all the flavors of the ingredients in the paella. It isn’t paella if it is made with long grain rice. – I was all over this, since I had some time ago, bought some Calasparra paella rice that has been sitting on my pantry crying out to be used. Most also agree that real paella must contain olive oil, a sofrito, and saffron. I will discuss the sofrito below when discussing the pillars of paella. Paella should be cooked in a wide flat paella pan (this puts rice into contact with the pan so it can be cooked in a thin layer, it cooks evenly, and produces a dry texture and separate firm grains. Paella should never be creamy like risotto. The rice isn’t put into the paella until every guest has arrived. People can wait for the rice, but the rice cannot wait for the people. The man often makes paella, in Spain. A man, who would otherwise totally shun the kitchen, views the making of paella his obligation. – In our case, it was going to be a tag-team effort between Tom, my mother and I.
Paella was born in Valencia, a rice-producing area on Spain’s eastern coastline. Early paellas were cooked outdoors over wood-burning fires for farm workers. In Spain today, families and friends still gather outdoors to cook paella either over an open fire or using a specially designed paella grill. I wanted to re-create this image in our backyard. Even with a Weber kettle as our centerpiece, I must say, it looked like a photograph out of any cooking magazine – Plus it made Tom happy, because he got to play with fire. Also, traditionally, paella is made over an open wood fire, using branches from orange and olive trees. – Sorry, guys, no orange and olive trees, which means no go on this one, but I read that you can throw fresh herbs on the coals, I don’t know about adding flavor, but I’m sure that your backyard will smell woods-y. In Spain, paella is never made for less than two. It’s social production — perfect for a party. While you’re cooking, guests can sit outside sipping sangria or cava (Spanish champagne) and eating marconas (Spanish almonds) and manchego (Spanish cheese). In the Spanish home, traditionally, paella is made only for lunch, never for dinner and eaten from a communal pan. Great paella rests on six pillars: The rice, the pan, the heat, the sofrito, the liquid and the soccarat. The Rice: The best rice for paella is Bomba, a Spanish short-grain rice that is able to absorb three times its volume in liquid. When cooked, the grains remain separate and do not stick together. (The rice in paella should be dry and separate when done, not creamy like risotto.) The bad news is that Bomba rice is expensive compared to other rice varieties. The less expensive rice, like Calaspara, is used as every-day paella rice in Spain and will turn out a great paella without breaking your bank (ours did!). You can find either in La Tienda, an importer of high end Spanish products. They also sell saffron, paella pans, spanish pottery, chorizo, squid ink, cheese and all kinds of other goodies. The Heat: Over a smoking fire is how we “like to” roll. Paella needs even heat across the bottom of the whole pan and since most stove top burners are narrow and concentrate the heat in the center of the pan, they are not the best choice, since the paella pan are wider than your stove’s burners. The best choice is to use your charcoal or gas grill (Don’t try to cook over a wood fire; it is too hard to control the heat.). You can also add some wood chips or dried herbs onto the fire to add a whisp of smoke, just like the original, to impart somewhat to the flavor and perhaps “smokiness” to the dish. The Sofrito: The base flavor is provided by a sauté of aromatics called a sofrito. The components of the sofrito vary from region to region, but the technique is the same: sauté until the vegetables soften, the flavors meld and the resulting mix is thick enough to hold its shape. The mixture will darken and turn into a thick puree. The Liquid: The liquid used to cook the rice adds flavor and color to the rice. Usually a chicken broth will be used for chicken paella while a seafood broth would be used for a seafood paella. The Soccarat: Socarrat is the dark crunchy, scorched bits of crispy rice that fry on the bottom of the pan near the end of the cooking as the liquid evaporates. In fact the word comes from the Spanish word for “scorched” because it is slightly burned. Sometimes you get it, sometimes you don’t. To get it you need plenty of oil, and you’ve gotta keep a close eye on the final minutes. Just don’t let the rice burn. Soccarat is prized among Valencians and every recipe or instructional piece on paella will talk about the soccarat. It has been called the “prize in a well-made paella.” The flavor of the rice will change and improve dramatically once the soccarat has formed, so it is well worth the effort to see that your paella forms one. 1½ pounds firm-fleshed fish, cut in bite-sized pieces – we got snapper, but you can use monkfish, grouper, even cod. 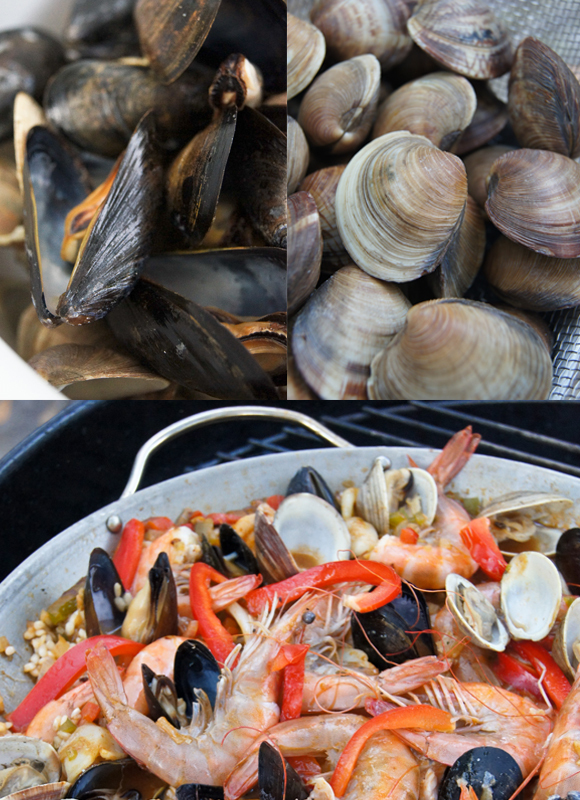 Paella assembly moves quickly so make sure you have all your ingredients measured, and cut in advance (mise en place) and in place, this includes the pre-made stock, mussels and clams. For the fish/seafood stock/broth: You can choose to make your own, like I did, and you can find good recipes here and here. Or, not slave over it, and get a little help from pre-made. I also pre-cooked my mussels and clams. The advantage of doing this ahead of time is that it gave me additional liquid (their juices) and I can discard any unopened shells and also this insures that you don’t over cook them in the paella. Place the mussels in a skillet with 3/4 cup white wine and some chopped parsley. Cover and bring to a boil on the stove. Remove the mussels as they open. When all the mussels have opened, pour the liquid from the skillet into a large pot. Do the same thing with the clams. Incorporate this into your seafood broth, add the saffron and keep the broth hot over low heat on the stove. Dry the fish, squid and shrimp well between paper towels. Sprinkle all over with salt and let sit 10 minutes at room temperature. With a mortar and pestle (something I love to do) or a mini processor, mash the parsley, garlic, thyme and 1/8 teaspoon salt into a paste. Stir in the paprika; add a little water if necessary to make the right consistency. Now get a tray and take everything to your grill. Including the salt, pepper and measured rice, your hot broth, utensils - and basically move your kitchen outside. Preheat a gas grill to medium high. If you are using charcoal, you’ll need enough coals for about 90 minutes of cooking. Prepare enough coals to cover the lower grate with only one layer, shoulder to shoulder. Put your paella pan over the hot part of the grill, let it heat for a minute, and add the oil. There should be enough to cover the bottom about 1/8” deep. If not, add more. You don’t want to skimp on the oil because it is necessary to form the socarrat. Make sure the grill is level so the oil covers the entire pan evenly. Quickly add (in batches), the fish, squid and shrimp and sauté each for 1-2 minutes. They should not be fully cooked. 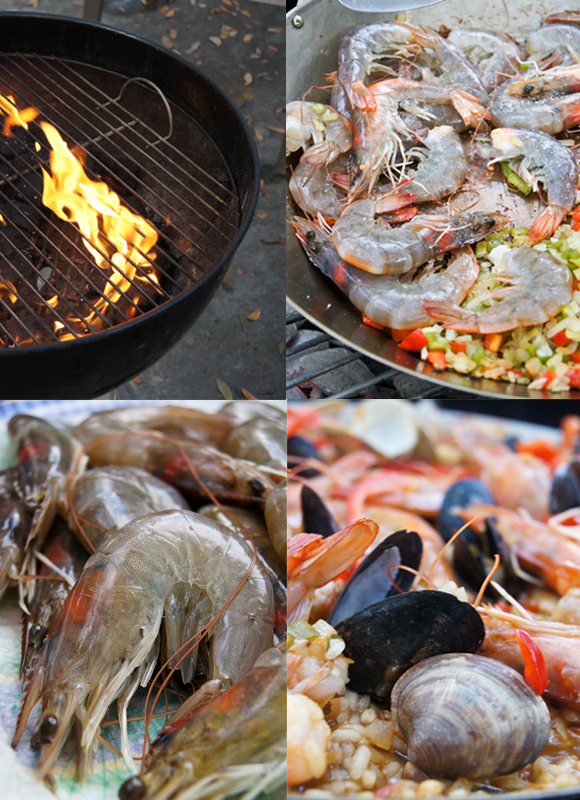 Remove the seafood to a warm platter and add the onions and peppers to the paella pan and cook over the grill until they are softened, about 5-7 minutes. Stir in the rice and coat well with the pan mixture. Pour in enough hot broth to cover the rice. The liquid should be boiling. Try not to stir the rice to much, since it will become sticky and you don’t want that. Also, rotate the pan occasionally. Add all the reserved fish and squid (but not the shrimp), and the parsley mixture paste. Taste for salt and continue to boil until the rice is no longer soupy. 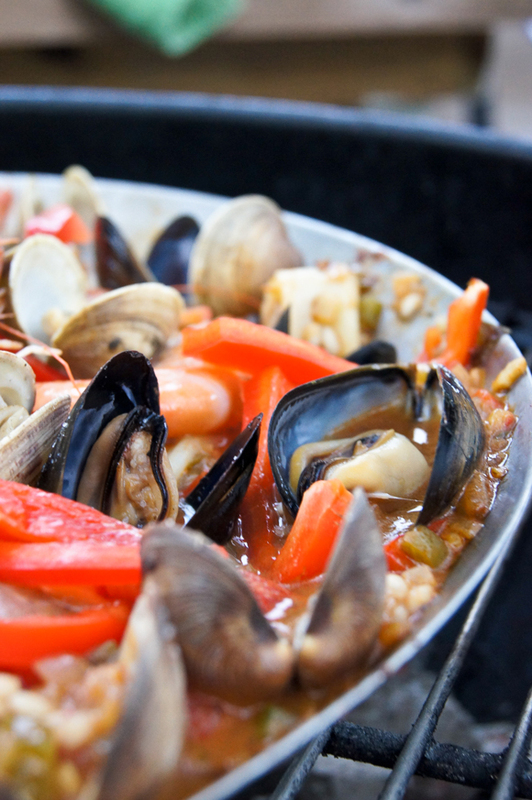 Arrange the shrimp and the cooked mussels and clams over the rice. Cook, uncovered, for 15-20 minutes until the rice is almost al dente. Taste a small forkful. The rice should have some chew, but not be hard, nor should it be mushy or gummy. If it is still hard and the liquid is gone, add more broth, ¼ cup at a time. Make sure you are tasting along the way, to season it with salt and pepper if needed. If you are going to garnish it with chopped parsley, sprinkle it on now, also squeeze some of the lemon juice at this point as well - the juice of half a lemon should do it. Remove the pan from the heat and drape a towel (or cover with aluminum foil) over the pan and let it rest for at least 5 minutes. To serve, place it on a trivet or a very thick stack of potholder or placemat or even towels so it does not scorch or crack your table. In Spain many families eat right from the pan and I encourage you to do the same, the experience is well worth it. As for Tom and I, we decided that this will become our new Christmas day tradition in our merge household. Are you ready to make your own? if so, remember to come back and leave a comment on your paella adventure.